I hope that the CREATOR will look after His Every creature in a befitting manner. 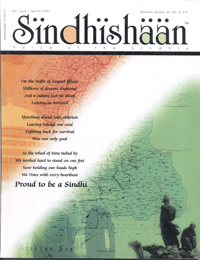 I have received a copy of “SINDHISHAAN” (Issue 1, 2001) through courtesy of brother Thakur Chawla. I have gone through this richly – worded and nicely edited cultural periodical. This is, no doubt a real voice of Sindhis living in Mumbai, Ulhasnagar, Rajasthan, Delhi, Maharashtra, Ajmir and other parts of India and even residing on both the banks of the Indus since centuries. By virtue of its getup, front title cover and architectural blocks, it appears to be a royal book of Sindhis which is also fully pregnant with research – oriented work on Sindhi Civilization that took birth on the fertile banks of the Indus, The Mighty River has its direct references in our Holy Books such as Rig Veda in a figurative and flowery styles. The beautification of our culture and literature is such a way will keep our Sindhi language alive even in the days to come in view of the fact that this is the best way of dissemination of art and culture particularly for the benefit of our scattered communities. Shri Sundar Iyer’s article on “calling of the holy waters” reveals that a “Sindhu Ghat” and a “Research Centre” are being setup on the banks of the River Sindhu at Ladakh in which, there is every possibility that it can be turned into an “International Sindhi Trust”. I believe that our Sindh – born scholars in India have emerged as ambassadors of our Sindhi culture. This is a universally accepted dogma that to protect one’s language and culture, is one of the fundamental rights of human beings. If we have a glance at “The universal declaration of the human rights” put in practice by the UNO, we would find that it’s all the thirty (30) sections deal with protection of the basic rights of a man irrespective of caste, creed & colour right from the cradle to the grave. At page 57 of the SINDHISHAAN, the birth place of our National Poet Sachal Sarmast has been shown as “Darazan” which may be corrected as Daraza (Lines 4 & 17 refer). This seems to be spelling mistake, but since Draza is a proper noun, and occupies a pivotal place in the literature, it, therefore, requires to be corrected for our future references. A copy of an article on “Shah Abdul Latif Bhitai & His sources of inspiration” is enclosed herewith for publication in you August Magazine, if found objective one by your good offices.